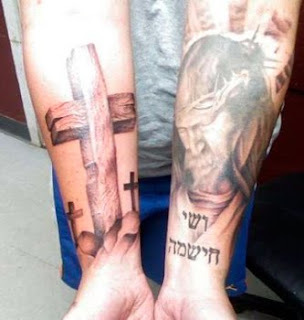 Bad Hebrew Tattoos: What Would Jesus Think? Unless it's written backwards, that is. This guy wanted a fancy "Christ my Lord and Savior" to complement his elaborate artwork. What he actually got was a rather more modest "Jesus the Messiah". What's worse - the message is spelled backwards. You don't have to get is tattooed, either. How about a nice piece of jewelry instead? Not permanent - that's a big advantage! Yeah, but I don't like how "Jesus" and "savior" are nearly the same word, so I used the other word for savior. Not only did he get it backwards, but he got 'ישו', which is the derogatory name for Jesus in Judaism, an abbreviation of 'ימח שמו וזכרו' ('may his name and memory be forgotten'). 'ישוע' was the person's real name. There's much debate whether 'ישו' is intentionally derogatory or just more convenient to use (with the negative meaning added later). In any case, you're right in that it's better to use 'ישוע'. There's no controversy attached and it most likely was his real name. Also, the backwards text spells "and gift, fastwhat". Yes^, The tatto was a gift, someone made fast money, and you look at it and say "What?" The victim does look like he's awaiting handcuffs. probably wise if it keeps him from reaching his wallet. I think jesus would think: WTF? but i think that in the religious context, להושיע is more accurate than להציל (which always reminds me of lifeguards at the beach) anyway. You're definitely right about the religious context, but I still don't like how it looks twice in a sentence. If I were to get this on my left forearm going up and down which direction would it go?